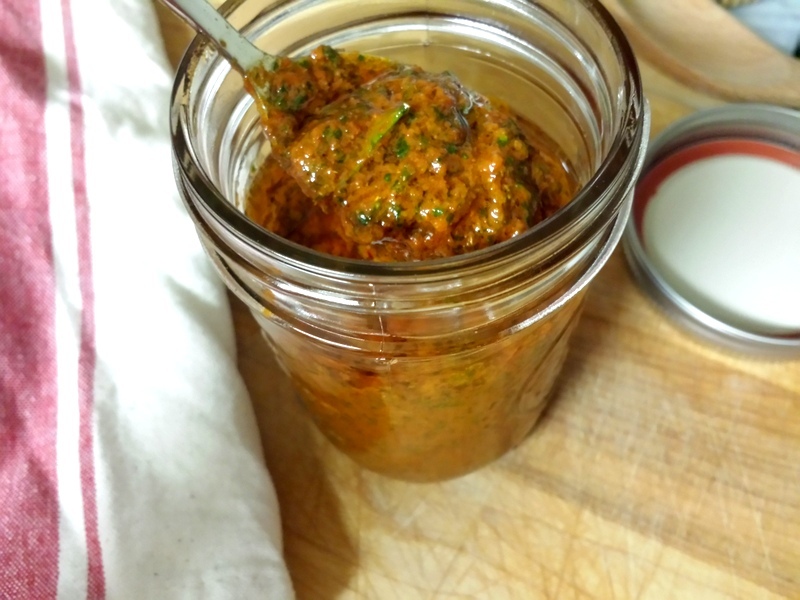 Charmoula is a sauce that’s used in a lot of Moroccan cuisine. Use it to marinage chicken, lamb, fish, etc. It can also be added to a recipe. You can store it in your refrigerator for up to two weeks. Use a quart jar – it makes it easier to shake/mix, plus left-overs can be sealed and refrigerated. Place the salt, both paprikas, cumin and pepper in a jar; shake to combine. Add garlic, parsley, cilantro, lemon rind and lemon juice; give it another shake. Add oil, water, tomatoee puree and saffron water. Crumble 1/2 tsp saffron in a dry, warm (not hot) skillet. Remove threads and place in a jar; crush threads with a pestle. Add 1 cup hot water. Let sit a few minutes. You can either store it in the refrigerator for a week or you can fill ice cube trays, freeze it, remove the cubes and place them in a plastic freezer bag. Each cube will yield about 2 tbsp saffron water.